Purdue University researchers have developed a unique, toxin-free adhesive system developed from underwater creatures. They hope it will make plywood, cardboard boxes and other packaging – combined $100 billion industries – both safer and easier to use. "We want to be able to reduce the daily exposure we all have to common toxins, and this type of materials development could lead to a giant leap in sustainability," said Amelia Putnam, a doctoral research chemist, who serves as a senior member of the research team. The Purdue team's adhesive is inspired from underwater creatures and does not contain formaldehyde, a major component of common glues used in the manufacturing of composite wood products such as plywood and fiberboard and linked to some types of cancers. These materials are common in the construction of houses and furniture. "Our adhesives mimic some of those found in the seas and might be able to solve two problems that we are facing currently – creating bonds using less toxic materials as well as having improved functions such as degradability," said Jonathan Wilker, a Purdue professor of chemistry and materials engineering, who helps lead the research team. 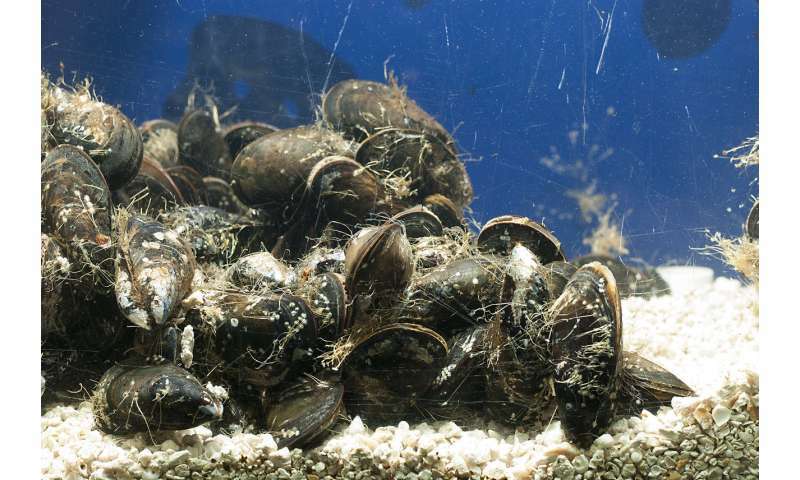 "We have been able to make progress here by first learning how marine mussels stick themselves to rocks." The Purdue team's adhesive may also work for food packaging, where the glue would provide an effective non-toxic alternative to the current adhesives being used now. "Another potential advantage of our adhesives is that they may be broken down, allowing bonded components to be separated for recycling," Putnam said.